Mount St Mary Hospital Green Space is in the seaside city of Victoria, one of thirteen communities that form the Capital Regional District of British Columbia. The landscaped gardens of this residential care facility were initially tended by the missionaries that were involved with the gardens of the old St Joseph’s Hospital and St. Ann’s Academy in the late eighteen hundreds. Located at 861 Fairfield Road near downtown Victoria, B.C., the patio garden, children’s playground and pathways are for use of the two hundred residents, staff and visitors at this publicly funded yet privately operated facility. Heritage trees and boxwood hedges with colorful flowering plants can be enjoyed from the footpaths on the property. The limited access to this area, in additional to the many signs, is shown by its wrought iron fence supported by rock pillars. The wrought iron fence surrounds the property in addition to the stone wall seen along Humbolt Street. The entrance way to the building and garden, from the corner of Quadra Street and Fairfield Road, has a gently curving twenty-five meter foot path that connects to the driveway, cleverly bypassing the stairs. A sixty-five meter sloping pathway from Fairfield Road passes the chapel, located to the right, to connect with the main entrance. 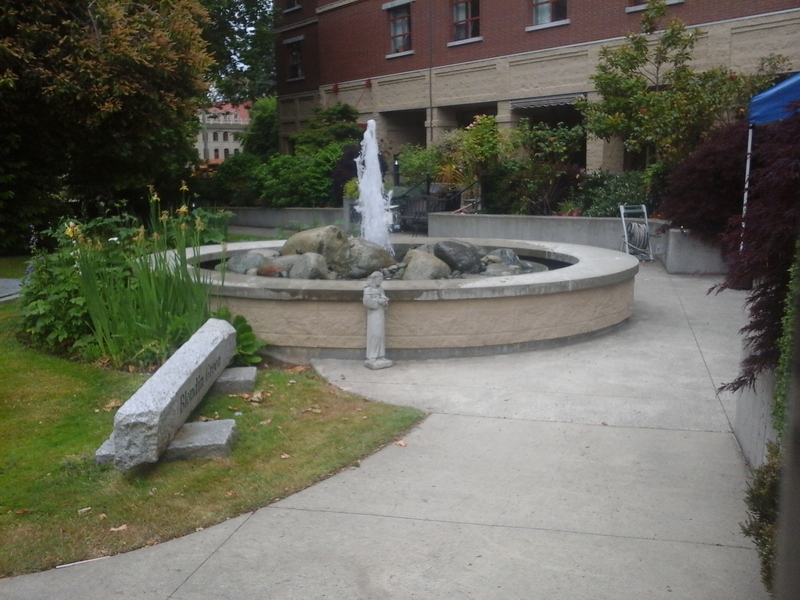 The Marie Ann Blondin Garden and fountain, as well the chapel, commemorates the foundress for the hospital that was established in nineteen forty one. When the five story building was built in twenty o three, a concrete footpath was created to loop through the garden area containing the children’s wooden playset, fountain and courtyard. The playset has climbing apparatus that leads a platform and slide. There is a single swing. Several benches, shaded by London plane trees, are near this area too. On the northwest side of the building is a second-story patio garden with seventy meters of concrete footpaths around two grass covered areas. For those curious about the building’s symbol on the north facing wall of the building. It is composed of a cross with three interlocking circles that represent the words non nobis solum meaning “not for ourselves alone”. St. Joseph’s Hospital Green Space, Fairfield Road Quadra Street Green Space, Collinson Street Green Space, St Ann’s Academy Gardens, Beacon Hill Park and Cridge Park are nearby. Mount St. Mary Hospital Garden can be reached from the Trans Canada Highway. Continue along the highway as it becomes Douglas Street. Turn right onto Fairfield Road and continue to Quadra Street where the southwestern edge of the gardens can be seen. There is roadside parking along these streets and a small paid parking area associated with this facility. City buses travel to the park from downtown Victoria.